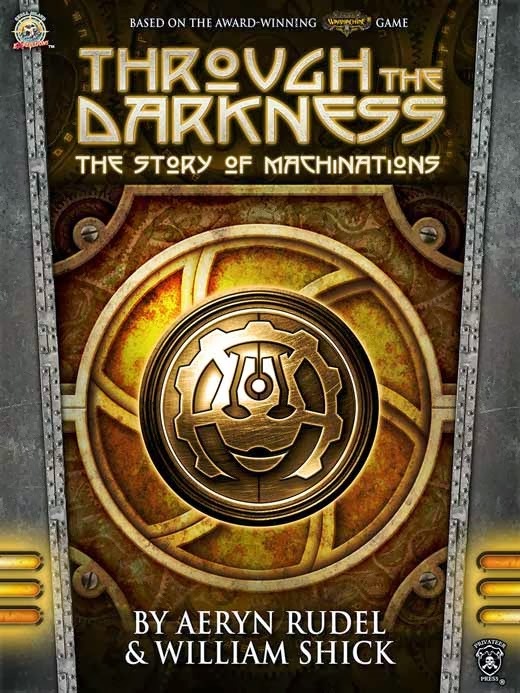 Through the Darkness: The Story of Machinations is a collection of the monthly fiction that was released during the year long Machinations league for Wamachine which introduced the new playable faction, the Convergence of Cyriss. The heroes of the story are Rutger Shaw and Taryn di la Rovissi who start out escorting a group of Llaelese resistance fighters to the town of Dunlyf which lies empty of all residents which seemed to have vanished without a trace. Rutger and Taryn are joined by Harlan Versh as they investigate the disappearances. The soon run across an ancient evil known as the cephalyx and must make an uneasy alliance with the forces of Cyriss. There are two things that I really like about this book. First, there is a short history of the Iron Kingdoms. It's just a few pages just giving the reader a quick run down of who's who and what's what. Unlike other books that have several chapters dedicated to this, before the story even gets started, these few pages get the job quick and easy for those unfamiliar with the Iron Kingdoms. Next, like other books there is a glossary at the end of the book for reference and for those who want to know more about the Iron Kingdoms setting. The book is a quick read, and has pretty good balance of combat, action/adventure, mystery, terror and even had some laughs in there. A good read for all fans of the Iron Kingdoms and not a bad read for anybody on the outside looking in. If you fancy fantasy, steampunk or gritty warfare, give this one a try.